Compared with OHV pushrod systems with the same number of valves, the reciprocating components of the OHC system are fewer and have a lower overall mass. Though the system that drives the camshafts may be more complex, most engine manufacturers accept that added complexity as a trade-off for better engine performance and greater design flexibility. The fundamental reason for the OHC valvetrain is that it offers an increase in the engine's ability to exchange induction and exhaust gases (this exchange is sometimes known as "engine breathing"). Another performance advantage is gained as a result of the better optimised port configurations made possible with overhead camshaft designs. With no intrusive pushrods, the overhead camshaft cylinder head design can use straighter ports of more advantageous cross-section and length. The OHC design allows for higher engine speeds than comparable cam-in-block designs, as a result of having lower valvetrain mass. The higher engine speeds thus allowed increases power output for a given torque output. Single overhead camshaft (SOHC) is a design in which one camshaft is placed within the cylinder head. In an inline engine, this means there is one camshaft in the head, whilst in an engine with more than one cylinder head, such as a V engine or a horizontally-opposed engine (boxer; flat engine) – there are two camshafts, one per cylinder bank. In the SOHC design, the camshaft operates the valves directly, traditionally via a bucket tappet; or via an intermediary rocker arm. 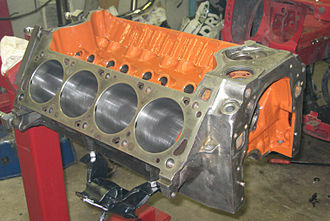 SOHC cylinder heads are generally less expensive to manufacture than double overhead camshaft (DOHC) cylinder heads. Timing belt replacement can be easier since there are fewer camshaft drive sprockets that need to be aligned during the replacement procedure. SOHC designs offer reduced complexity compared with overhead valve designs when used for multivalve cylinder heads, in which each cylinder has more than two valves. An example of an SOHC design using shim and bucket valve adjustment was the engine installed in the Hillman Imp (four cylinder, eight valve), a small, early-1960s two-door saloon car (sedan) with a rear-mounted aluminium-alloy engine based on the Coventry Climax FWMA race engines. Exhaust and inlet manifolds were both on the same side of the engine block (thus not a crossflow cylinder head design). This did, however, offer excellent access to the spark plugs. In the early 1980s, Toyota and Volkswagen Group also used a directly actuated SOHC parallel valve configuration with two valves for each cylinder. The Toyota system used hydraulic tappets. The Volkswagen system used bucket tappets with shims for valve-clearance adjustment. The multivalve Sprint version of the Triumph Slant-4 engine used a system where the camshaft was placed directly over the inlet valves, with the same cams that opened the intake valves also directly opening the exhaust valves via rocker arms. Honda later used a similar valvetrain system in their motorcycles, using the term "Unicam" for the concept. This system uses one camshaft for each bank of cylinder heads, with the cams operating directly onto the inlet valve(s), and indirectly, through a short rocker arm, on the exhaust valve(s). This allows a compact, light valvetrain to operate valves in a flat combustion chamber. The Unicam valve train was first used in single cylinder dirt bikes and has been used on the Honda VFR1200 since 2010. 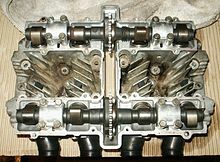 A dual overhead camshaft (DOHC) valvetrain layout is characterised by two camshafts located within the cylinder head, one operating the intake valves and the other one operating the exhaust valves. 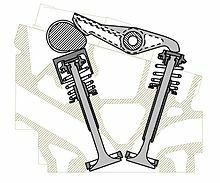 This design reduces valvetrain inertia more than is the case with an SOHC engine, since the rocker arms are reduced in size or eliminated. 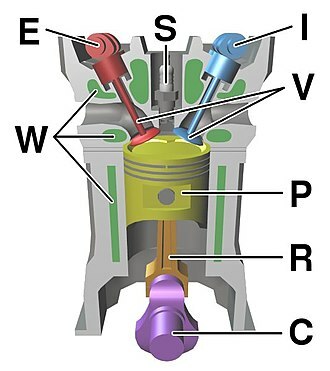 A DOHC design permits a wider angle between intake and exhaust valves than in SOHC engines. This can give a less restricted airflow at higher engine speeds. DOHC with a multivalve design also allows for the optimum placement of the spark plug, which in turn improves combustion efficiency. Engines having more than one bank of cylinders (e.g. 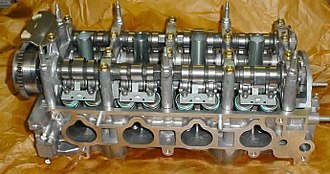 V6, V8 – where two cylinder banks meet to form a "V") with two camshafts in total remain SOHC and "twin cam" unless each cylinder bank has two camshafts; the latter are DOHC, and are often known as "quad cam". Although the term "twin cam" is often used to refer to DOHC engines, it is imprecise, as it includes designs with two block-mounted camshafts. Examples include the Harley-Davidson Twin Cam engine, Riley car engines from 1926 to the mid 1950s, Triumph motorcycle parallel-twins from the 1930s to the 1980s, and Indian Chief and Scout V-twins from 1920 to the 1950s. The terms "multivalve" and "DOHC" do not refer to the same thing: not all multivalve engines are DOHC and not all DOHC engines are multivalve. 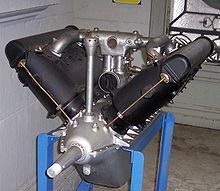 Examples of DOHC engines with two valves per cylinder include the Alfa Romeo Twin Cam engine, the Jaguar XK6 engine and the Lotus Ford Twin Cam engine. Most recent DOHC engines are multivalve, with between three and five valves per cylinder. More than two overhead camshafts are not known to have been tried in a production engine. However, MotoCzysz has designed a motorcycle engine with a triple overhead camshaft configuration, with the intake ports descending through the cylinder head to two central intake ports between two outside exhaust camshafts actuating one of two exhaust valves per cylinder each. Toothed timing belts made from rubber and kevlar are commonly used to time overhead camshaft automobile engines. Compared with other camshaft drive systems, timing belts have low design, engineering and production costs, low noise levels, low mass (and consequently low inertia), low space requirements, and no need for lubrication. Timing belt systems are also simpler and more versatile than other drive systems; while it is possible to power engine components such as water pumps or alternators with bevel shaft or gear drive systems, it is simpler to do so with belts. The first known automotive application of toothed belts to drive overhead camshafts was with Devin-Panhard racing specials built by Bill Devin for the Sports Car Club of America (SCCA) H-modified racing series. Some of these specials were powered by engines built from the crankcases of Panhard flat-twin engines and the cylinders of Norton motorcycles. The overhead camshafts on the Norton cylinders were driven by toothed belts from the Gilmer Belt Company instead of the tower shafts used in the Norton engines. Jimmy Orr won the 1956 SCCA H-modified championship in an overhead camshaft Devin-Panhard. The first production automobile engine to use a toothed belt to drive an overhead camshaft was made by Glas for use in their 1004 motor car, introduced in September 1961. Duplex or single row roller chains have been used to drive overhead camshafts in automobile and motorcycle engines. By the early 1960s most production automobile overhead camshaft designs used chains to drive the camshaft(s). Timing chain systems are noisier and more expensive than timing belt systems. Timing chains do not usually require replacement at regular intervals, but there have been exceptions, including the timing chain in the Triumph Stag, which has a recommended life of 30,000 miles (48,000 km). The use of a shaft with bevel gears to drive the camshaft was common in overhead camshaft designs before the Second World War. Examples include the Maudslay 25/30 built between 1908 and 1911, the Bentley 3 Litre, the 850cc MG Midget and various racing motorcycles including the Velocette "K" series and the Norton Manx. 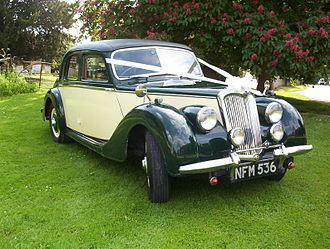 The MG engine used the armature shaft of the dynamo as the camshaft drive, which was an economical use of parts but made servicing difficult. British engineer J. G. Parry-Thomas developed a camshaft drive using three sets of cranks and rods in parallel. Parry-Thomas used this drive system in the Leyland Eight. W. O. Bentley used a similar system, called the "three-throw drive", in his six-cylinder engines, the 6½ Litre and the 8 Litre. The overhead camshaft of the NSU Prinz used a two-rod system with counterweights at both ends of the drive system. 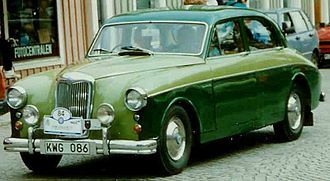 NSU began using the system in the early 1950s and continued to use it in the Prinz 4 and Prinz Sport in the mid-1960s, although the NSU 1000 used a chain-driven system instead. The NSU Max and Sportmax 250cc single motorcycle engines also used the two-rod system, very successfully. In conjunction with multiple valves (three, four or five) per cylinder, many OHC engines today[when?] employ variable valve timing to improve efficiency and power. Among the first cars to utilize engines with single overhead camshafts were the Maudslay designed by Alexander Craig and introduced in 1902 and the Marr Auto Car designed by Michigan native Walter Lorenzo Marr in 1903. The first DOHC car was the 1912 Peugeot which won the French Grand Prix at Dieppe that year. This car was powered by a straight-4 engine designed by Ernest Henry under the guidance of the technically knowledgeable racing drivers Paul Zuccarelli and Georges Boillot. Boillot, who drove the winning car that year, won the French Grand Prix for Peugeot again in 1913 but was beaten in 1914 by the SOHC Mercedes of Christian Lautenschlager. 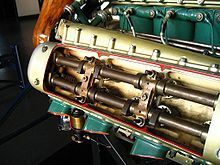 A World War I-era Hispano-Suiza V8 aviation engine, which used fully enclosed single overhead camshaft drivetrains for each cylinder bank. Both the Allies and the Central Powers quickly adapted the overhead camshaft engine designs that had been used in racing cars just before the First World War to their liquid-cooled aircraft engines. The 1914 Mercedes SOHC racing car engine became the starting point for both Mercedes' six-cylinder aero-engine family and the Rolls-Royce Eagle V12, whose cylinder heads were reverse-engineered from a Mercedes racing car left behind in England at the beginning of the war. The Mercedes designs culminated in the Mercedes D.III. 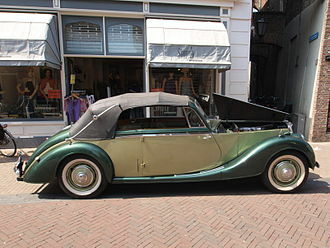 Other SOHC designs included the fully enclosed-drivetrain Hispano-Suiza 8 – a V8 engine designed by Marc Birkigt and the late-war Liberty L-12 on the Allied side; and the powerful BMW IIIa on the side of the Central Powers. The aircraft engines listed above all used bevel gear-driven rotary shaft camshaft drives. Large aircraft engines, particularly air-cooled, saw considerable thermal expansion over the height of the cylinder block. This made pushrod engines difficult to arrange. As well as the other advantages of direct valve actuation by an overhead camshaft, a bevel shaft with a sliding spline was the easiest way to allow for this expansion. These bevel shafts were usually in an external tube outside the block, and were known as "tower shafts". By the end of the war the DOHC Napier Lion had entered service with the Allies. Among the early pioneers of DOHC were Isotta Fraschini's Giustino Cattaneo, Austro-Daimler's Ferdinand Porsche, Stephen Tomczak (in the Prinz Heinrich) (in 1919); Sunbeam built small numbers of racing models between 1921 and 1923 and introduced one of the world's first production DOHC auto engines in 1924 – the Sunbeam 3 litre Super Sports, an example of which came second at Le Mans in 1925. The first DOHC engines were either two- or four-valve per cylinder racing car designs from companies like Fiat (1912), Peugeot Grand Prix (1912, four-valve), Alfa Romeo Grand Prix (1914, four-valve) and 6C (1928), Maserati Tipo 26 (1926), Bugatti Type 51 (1931). and three years later, Harry A. Miller and Fred Offenhauser inaugurated the line of 4.1 litre DOHC Offenhauser inline-4 American auto racing engines, which began to dominate American open-wheel auto racing through much of the 20th century. American luxury automaker Duesenberg was an early proponent of overhead camshaft engines with their SOHC straight eight Model A, produced from 1921-1927. Duesenberg also produced successful OHC race car engines in the 1920s. The 1928-1937 Duesenberg Model J featured a 420 cu in (6.9 L) DOHC straight eight engine producing 265 horsepower. At the other end of the scale and in the UK, MG, Morris, Wolseley and Singer used OHC engines in their light cars before 1930, and in the motorcycle sphere, Velocette and Norton produced sports models as well as TT racing machines in the 1920s and 1930s. Several other motorcycle makers followed this trend, too. 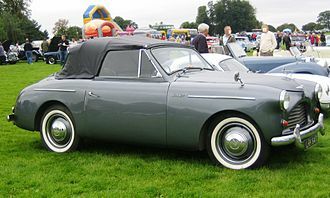 Crosley, an American manufacturer of small, low-priced cars, used a 44 cu in (724 cc) 4-cylinder SOHC engine following World War II. The original version of the engine was developed during the war by Lloyd Taylor and built under license by Crosley for military applications, including as a powerplant for generators. This design was made of steel stampings, copper-brazed together to form a strong and light block assembly. It was known as the CoBra engine ("COpper BRAzed") and generated 26.5 hp (19.8 kW) in automotive form. The overhead camshaft was driven by a tower shaft and gears. The bi-metallic construction of the CoBra engine and the salt-based antifreeze then in common use led to electrolysis and corrosion problems. A more traditional design with a cast iron block assembly (CIBA) was introduced in 1949; the components and dimensions were otherwise the same as the CoBra. 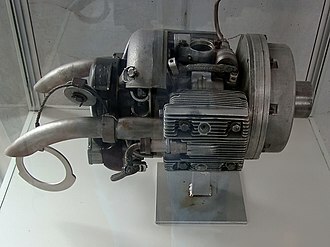 Used in Crosley's Hot Shot sports car, this small OHC engine won the first race at Sebring in 1950. The Crosley OHC was popular in H-modified racing for its high-RPM performance. After Crosley ceased automotive production, the engine was produced by several other companies for many years, its last application being the Bearcat 55 outboard motor manufactured by Fisher Pierce, builders of the Boston Whaler boats. When DOHC technology was introduced in mainstream vehicles, it was common for it to be heavily advertised. While used at first in limited production and sports cars such as the 1925 Sunbeam 3 litre, Alfa Romeo is one of the twin cam's greatest proponents. 6C Sport, the first Alfa Romeo road car using a DOHC engine, was introduced in 1928. Ever since this, DOHC has been a trademark of most Alfa Romeo engines (some Alfa V6 engines are SOHC, not DOHC. Most Alfasud boxer engines were also SOHC). The Jaguar XK6 engine with chain-driven DOHC was displayed in the Jaguar XK120 at the London Motor Show in 1948, and used across the entire Jaguar range through the late 1940s, 1950 and 1960s. ^ "OHV, OHC, SOHC and DOHC (twin cam) engine - Automotive illustrated glossary". Samarins.com. Retrieved 2018-09-20. ^ Boddy, William (January 1964). Boddy, William, ed. "Random Thoughts About O.H.C." Motor Sport. London, UK: Teesdale Publishing. XL (1): 15–18. ^ a b c d e f g h i Tan, Paul (22 June 2005). "SOHC vs DOHC Valvetrains: A Comparison". PaulTan.org. Driven Communications Sdn Bhd. Retrieved 29 August 2012. ^ Heseltine, Richard (June 2010). Roebuck, Nigel, ed. "Triumph Dolomite Sprint". Motor Sport. London, UK. 86 (6): 122. ISSN 0027-2019. Retrieved 29 March 2015. ^ Lewis, Jimmy (November 2001). Edwards, David, ed. "New for '02: Honda CR250R CRF450R". Cycle World. Hachette-Filipacchi Magazines. 40 (11): 62. ISSN 0011-4286. Retrieved 2 January 2015. ^ "How It Works: Honda Unicam® Engines". 23 January 2013. Archived from the original on 22 February 2014. Retrieved 2 January 2015. ^ Cantin, Marc (19 October 2009). "2010 Honda VFR1200A First Ride". Moto123.com. Archived from the original on 2 January 2015. Retrieved 2 January 2015. ^ "Introducing MotoCzysz Z-Line 4 Engine". MotoCzysz. MotoCzysz.com. 2006-08-25. Retrieved 29 August 2012. ^ a b "Dan's motorcycle 'Cam Drives'". dansmc.com. Retrieved 29 August 2012. ^ Decker, John (June 1993). Oldham, Joe, ed. "Saturday Mechanic: Replacing Your Timing Belt". Popular Mechanics. New York, NY US: Hearst. 170 (6): 93. ISSN 0032-4558. Retrieved 1 March 2015. ^ Decker 1993, pp. 93–94. ^ a b Decker 1993, p. 94. ^ Decker 1993, pp. 94–95. ^ Dorries, Elisabeth H. (2005). TechOne: Automotive Engine Repair. Clifton Park, NY US: Thompson Delmar Learning. p. 250. ISBN 1-4018-5941-0. LCCN 2004057974. Retrieved 1 March 2015. ^ Dorries 2005, p. 250. ^ Pace, Harold W.; Brinker, Mark R. (2004). Vintage American Road Racing Cars 1950-1969. St. Paul MN US: MotorBooks International. p. 62. ISBN 0-7603-1783-6. Retrieved 27 February 2015. ^ Pace & Brinker 2004, p. 62. ^ Boddy 1964, p. 17. ^ a b Dorries 2005, p. 253. ^ Boddy, William (August 1972). Boddy, William, ed. "An Edwardian Overhead-Camshaft 25/30 Maudslay". Motor Sport. London, UK: Teesdale Publishing. XLVIII (8): 909. Archived from the original on 6 February 2015. Retrieved 6 February 2015. ^ Norbye, Jan P. (1981). The complete handbook of automotive power trains. Tab Books. p. 318. ISBN 0-8306-2069-9. LCCN 79026958. Retrieved 7 January 2015. ^ Cameron, Kevin (March 2004). "TDC: Little things". Cycle World. 43 (3): 14. ISSN 0011-4286. Retrieved 7 January 2015. ^ Walker, Mick (2003) . "4 Engine". Ducati Singles Restoration. St. Paul, MN US: Motorbooks International. p. 48. ISBN 0-7603-1734-8. Retrieved 4 January 2015. ^ "2015 W800". Kawasaki Motors Europe. 2014. ^ Ash, Kevin (26 October 2011). "Kawasaki W800 review". The Telegraph. Archived from the original on 21 June 2013. ^ Bennett, Sean. Modern Diesel Technology: Diesel Engines. Stamford, CT US: Cengage Learning. pp. 88–89, 362. ISBN 978-1-285-44296-9. Retrieved 4 January 2015. In most commercial diesels, OHCs are gear-driven. ^ a b Boddy, William (March 1974). Boddy, William, ed. "How Did The Leyland Eight Rate?". Motor Sport. L (3): 230. Retrieved 3 January 2015. ^ Boddy 1964, p. 16. ^ Boddy 1964, pp. 17, 18. ^ Boddy 1964, p. 18. Georgano, G. N. (1982) . "Maudslay". In Georgano, G. N. The New Encyclopedia of Motorcars 1885 to the Present (Third ed.). New York: E. P. Dutton. p. 407. ISBN 0525932542. LCCN 81-71857. ^ Thorpe, Leslie Aaron (1936). A text book on aviation: the new cadet system of ground school training. 3. Aviation Press. pp. 14–15. Retrieved 27 February 2015. The overhead camshafts are driven by bevel gears and vertical shafts known as tower shafts. ^ a b Kevin Clemens (February 2009). "An Echo of the Past — the history and evolution of twin-cam engines". EuropeanCarWeb.com. European Car Magazine, Source Interlink Media. Archived from the original on 3 March 2012. Retrieved 29 August 2012. ^ Mueller, Mike (2006). "Chapter 6 - Chariot of the Gods Duesenberg Straight Eight". American Horsepower 100 Years of Great Car Engines. St. Paul, MN USA: Motorbooks. p. 51. ISBN 978-0-7603-2327-4. LCCN 2006017040. Retrieved 2015-02-02. ^ Simanaitis, Dennis (January 1994). Bryant, Thos L., ed. "Tech Tidbits". Road & Track. Newport Beach, CA US: Hachette Filipacchi Magazines. 45 (6): 121. ISSN 0035-7189. ^ Bollman, Jim. "Crosley Engine Family Tree - Taylor Years". ^ a b Simanaitis 1994, p. 121. ^ Bollman, Jim. "Crosley Engine Family Tree - CoBra Years". ^ Bollman, Jim. "Crosley Engine Family Tree - CIBA Years". ^ ( Bollman, Jim. "Crosley Engine Family Tree - Big Block Years". ^ "Technical- Boxer History". Alfisti.co.uk. Archived from the original on 29 March 2013. 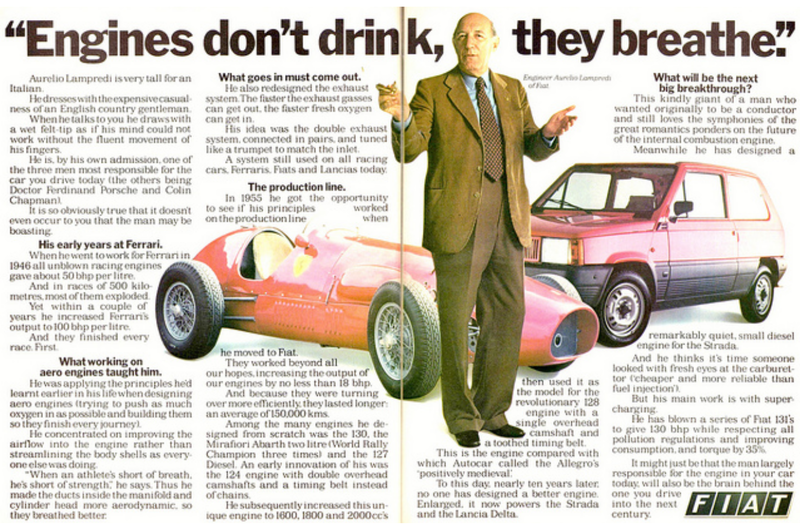 ^ "Old Fiat ad with Aurelio Lampredi". Retrieved 31 January 2015. These Honda D series inline-four cylinder engine is used in a variety of compact models, most commonly the Honda Civic, CRX, Logo and Stream. Engine displacement ranges between 1.2 and 1.7 liters, the D Series engine is a SOHC and might include VTEC variable valve timing. Power ranges from 62 hp in the Logo to 130 PS in the Civic Si, D-series production commenced 1984 and ended 2005. 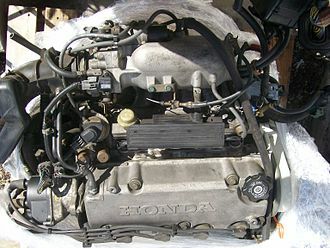 D-series engine technology culminated with production of the D15B 3-stage VTEC which was available in markets outside of the United States, earlier versions of this engine used a single port fuel injection system Honda called PGM-CARB, signifying the carburetor was computer controlled. 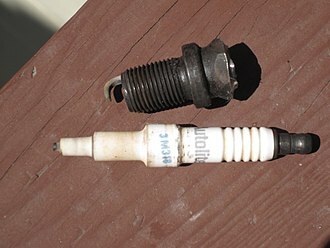 Found in, 1997–2000 Honda Civic 1. 4i MB2/MB8 Displacement,1,396 cc Compression,9.0,1 Power,75 PS at 6,000 rpm Torque,112 N·m at 3,000 rpm Valvetrain, SOHC, non VTEC Found nnlml mm, [, mp, Germany. They are almost identical to the D14A3 and D14A4 engines, differences are only in the compression ratio and some different mounted components. Stock BHP Rating,90 hp at 5,600 rpm Stock torque rating,130 Nm at 4,300 rpm Rated Fuel Consumption,0.52 ->0.65 Liters pr. Rpm Valvetrain, SOHC16 Valve VTEC Switchover, Non-VTEC Fuel Control, Found in, 1998–2000 Honda Civic GX Bore and Stroke, see D16 Series Engines Displacement, see D16 Series Engines Rod Length,137 mm Compression,12.5,1 Combustion Chamber Volume,32. They are similar to the D16Y4, D16A8, D16Z6, D16A1, D16A3, D16A6, D16A9, there are both SOHC and DOHC ZC engines. 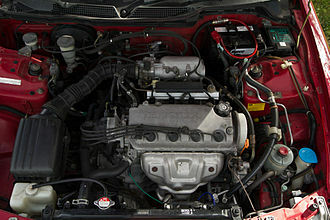 The non-VTEC SOHC ZC is similar to the D16A6 and D16Y4 engine, the SOHC VTEC ZC is similar to the D16Z6. The DOHC ZC is similar to the D16A1, D16A3, D16A8, D16A9 and these were replaced by the D16A8 or B16A, depending on the specs. 1st Gen ZC Identified by, External coil, small distributor, dual butterfly TB, cam cover bolts on top, +3cc PG6B pistons, non-pent roof combustion chamber. As a ZC it appeared in JDM AV Integra Si and JDM E-AT Civic/CR-X Si, commonly produced at the time but now over twenty years old and getting harder to find. A combustion chamber is that part of an internal combustion engine in which the fuel/air mix is burned. 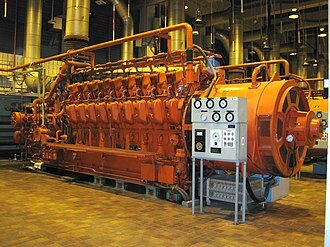 ICEs typically comprise reciprocating piston engines, rotary engines, gas turbines, the combustion process increases the internal energy of a gas, which translates into an increase in temperature, pressure, or volume depending on the configuration. In an enclosure, for example the cylinder of an engine, the volume is controlled. In a continuous system, for example a jet engine combustor, the pressure is controlled. 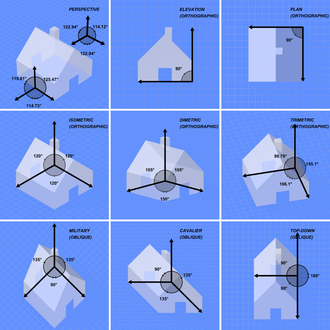 This increase in pressure or volume can be used to do work, for example, if the gas velocity changes, thrust is produced, such as in the nozzle of a rocket engine. At top dead centre the pistons of an engine are flush with the top of the cylinder block. 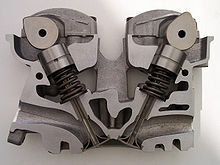 The combustion chamber may be a recess either in the cylinder head, a design with the combustion chamber in the piston is called a Heron head, where the head is machined flat but the pistons are dished. The Heron head has proved even more efficient than the hemispherical head. Intake valves permit the inflow of a fuel air mix, and this is best achieved with a compact rather than elongated chamber. Swirl & Squish The intake valve/port is usually placed to give the mixture a pronounced swirl above the piston, improving mixing. The shape of the top affects the amount of swirl. Another design feature to promote turbulence for good fuel/air mixing is squish, where swirl is particularly important, combustion chambers in the piston may be favoured. Flame front Ignition typically occurs around 15 degrees before top dead centre, the spark plug must be sited so that the flame front can progress throughout the combustion chamber. Harry Ricardo was prominent in developing combustion chambers for diesel engines, the combustion chamber in gas turbines and jet engines is called the combustor. Different types of combustors exist, Can type, Can combustors are self-contained cylindrical combustion chambers, each can has its own fuel injector, interconnectors, casing. 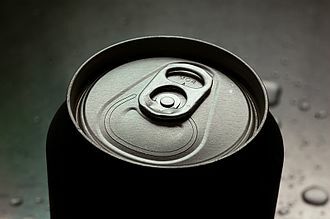 Each can get an air source from individual opening, cannular type, Like the can type combustor, can annular combustors have discrete combustion zones contained in separate liners with their own fuel injectors. 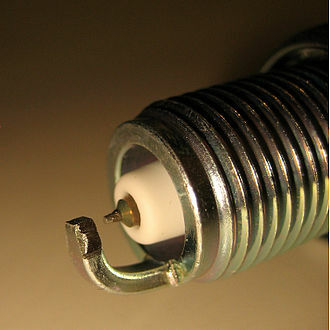 A spark plug has a metal threaded shell, electrically isolated from a central electrode by a porcelain insulator. The central electrode, which may contain a resistor, is connected by an insulated wire to the output terminal of an ignition coil or magneto. The spark plugs shell is screwed into the engines cylinder head. 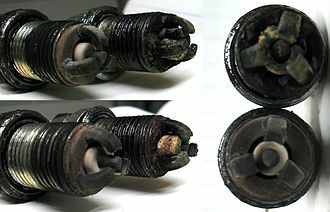 Spark plugs may be used in applications such as furnaces wherein a combustible fuel/air mixture must be ignited. In this case, they are referred to as flame igniters. In 1860 Étienne Lenoir used a spark plug in his gas engine. Early patents for spark plugs included those by Nikola Tesla, Frederick Richard Simms, helen Blair Bartlett played a vital role in making the insulator in 1930. The plug is connected to the voltage generated by an ignition coil or magneto. As current flows from the coil, a voltage develops between the central and side electrodes. Initially no current can flow because the fuel and air in the gap is an insulator, once the voltage exceeds the dielectric strength of the gases, the gases become ionized. The Honda CR-X, originally launched as the Honda Ballade Sports CR-X in Japan, is a front-wheel-drive sport compact car manufactured by Honda between 1983 and 1991. It was replaced by the Honda CR-X del Sol for the 1992 model year, although there are many supposed definitions for the acronym CR-X, the most widely accepted are Civic rally cross, and Civic renaissance model X. In the US, the CRX was marketed as an economy sport Kammback, the European-spec car received a ZC130 hp engine and a 2+2 seating arrangement. Redesigned in 1988 and produced to 1991, the CRX was popular for its performance, nimble handling, hondas 1992 CRX del Sol was marketed as a CR-X in some markets. For the 1984 model year, Honda introduced an all-new two-seater that shared the drivetrain with the Civic but offered unique styling, in North America, the CRX was marketed in two versions and sport. The economy model used a new aluminum 1.3 liter CVCC engine, the sport model featured an aluminum 1.5 liter four cylinder with three valves per cylinder and available with a 5-speed manual or 3-speed automatic. In spring 1985, Honda introduced an Si model featuring a 1.5 liter PGM-FI engine, the Si model included a power sunroof, rear wiper and 13-inch alloy wheels. For 1986, Honda updated the CRX with new headlights, body matched lower cladding. The Si model now included 14-inch alloy wheels and revised body colored lower body work, the interior was upgraded and added a center console with cassette tape storage. 1987 was virtually unchanged from 1986 and would be the year of the first generation CRX. The first generation CRX was sold in some regions outside Japan as the Honda Civic CRX, at its introduction, the CRX was available in Japan through Honda Verno dealership sales channels, and accompanied the Vigor, the Quint, and the Prelude. The Japanese Si and European 1. 6i-16 models came with a 1590 cc DOHC engine putting out 135 bhp in the UK-spec model and 140 bhp in the JDM model. Though similar versions of the engine, the Japanese Si engine was stamped ZC. Japanese buyers took advantage of the largest,1.5 L, engine while still paying the same amount of annual road tax. Triumph Engineering Co Ltd was a British motorcycle manufacturing company, based originally in Coventry and in Solihull at Meriden. A new company, Triumph Motorcycles Ltd based in Hinckley gained the rights after the end of the company in the 1980s and is now one of the worlds major motorcycle manufacturers. The company was started by Siegfried Bettmann, who had emigrated from Nuremberg, part of the German Empire, in 1884, aged 20, Bettmann had founded his own company, the S. Bettmann & Co. Bettmanns original products were bicycles, which the company bought and sold under its own name, Bettmann distributed sewing machines imported from Germany. In 1886, Bettmann sought a more specific name, and the became known as the Triumph Cycle Company. A year later, the company was registered as the New Triumph Co, now with funding from the Dunlop Pneumatic Tyre Company. During that year, another native of Nuremberg, Moritz Schulte, Schulte encouraged Bettmann to transform Triumph into a manufacturing company, and in 1888 Bettmann purchased a site in Coventry using money lent by his and Schultes families. The company began producing the first Triumph-branded bicycles in 1889, in 1896 Triumph opened a bicycle factory in Nuremberg. In 1898 Triumph decided to extend production at Coventry to include motorcycles, in 1903, after selling more than 500 motorcycles, Triumph began motorcycle production at the Nuremberg factory. By the end of year, the company had produced more than 250. In 1907, after the company opened a plant, it produced 1,000 machines. Triumph had initiated a lower-end brand, manufactured in the original plant. 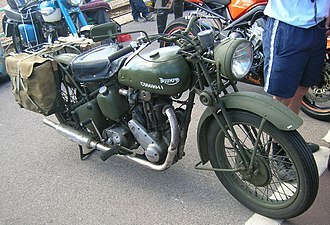 Confusion between motorcycles produced by the Coventry and Nuremberg Triumph companies resulted in the products being renamed Orial for certain export markets. 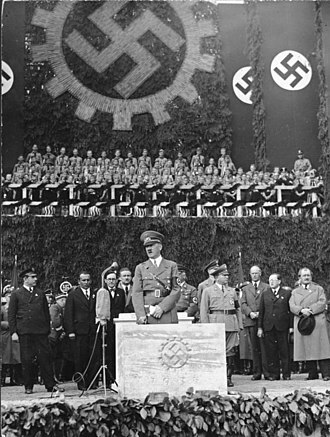 However, a company named Orial already existed in France, so the Nuremberg motorcycles were renamed again as TWN, the beginning of the First World War was a boost for the company as production was switched to provide for the Allied war effort. More than 30,000 motorcycles—among them the Model H Roadster known as the Trusty Triumph, after the war and Schulte disagreed about planning, with Schulte wishing to replace bicycle production with cars. The Indian Scout is a motorcycle built by the Indian Motocycle Company from 1920 to 1949. It rivaled the Chief as Indians most important model, the 101 Scout, made from 1928 to 1931, has been called the best motorcycle Indian ever made. The small-displacement Scout and the Sport Scout, introduced in 1934, were continued until the end of production in 1942. Military versions of models were used by US and other Allied forces during World War II. Apart from fifty examples of the 648, a racing version of the Sport Scout. In 1949 an all-new motorcycle, with an overhead valve engine, was called the Scout. 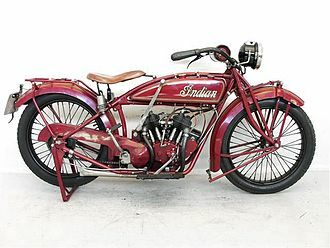 Between 2001 and 2003, the Indian Motorcycle Company of America, based in Gilroy, built a Scout model using proprietary engine, the Scout was introduced in October 1919 as a 1920 model. The Scout had a sidevalve V-twin engine with its transmission bolted to the casing, allowing a geared primary drive - the only American v-twin to use this maintenance-free system. The Scout engine initially displaced 606 cc, but the size was increased to 745 cc in 1927 in response to the popularity of the Excelsior Super X. In early 1928, a front brake was added to the Scout, in mid 1928 the Scout Series 101 replaced the original Scout. Franklin, who had designed the original Scout, the 101 Scout had a new frame with more fork rake, a longer wheelbase, and a lower seat height. The geometry of the 101 Scout wheelbase, steering head angle, the standard Scout 101 was available with a 45 cu in engine, but it was available with a 37 cu in engine from the original Scout, although this was rarely advertized. The 101 Scout was noted for its handling and was popular with racers, the economic hardship of the Great Depression pushed Indian to the brink of bankruptcy, and the company was purchased by the DuPont family. In 1931, it was decided to rationalize production by designing a new frame that, with some variations, would be used across their entire, new-for-1932 model range of Scout, Chief. Thus the 101 Scout was discontinued, as its chassis was as expensive to produce as the 74 cu in Chief. The 101 Scout has been called the best motorcycle Indian ever made, enthusiasts have differing views on the replacement of the 101 Scout. Honda VFR1200F engine with dual clutch transmission at the 2009 Tokyo Motor Show.